At FluenC, the material and the exam structure that we follow is in accordance with CEFR (Common European Framework of Reference), also recommended by most Embassies. (You can find more information on CEFR and other frameworks in our FAQs page here). In each level, we pay importance to 4 aspects of language learning, primarily: Reading (interwoven with vocabulary and grammar), Listening, Writing and Speaking, in the level based courses. Conversational courses are focused primarily on speaking and are not meant for certification. A1 Starter To be able to frame a simple sentence properly. Greetings, Numbers, Colors, Basic nuts and bolts, verbs, introduction of self and others, framing a question, are few – not all, examples of what are learnt in this level. Only the simple present and the present perfect tenses are learnt. Doing this level, will just give you a basic idea of the language. Words and public notices in the target country will seem familiar. But this level definitely does not ensure fluency. Nevertheless, it is a building block and one cannot go to other levels without passing this one. A2 Elementary/Waystage Start framing compound sentences with connectors like and, but, if, because etc. Slightly higher concepts such as comparisons and past tense are learnt. 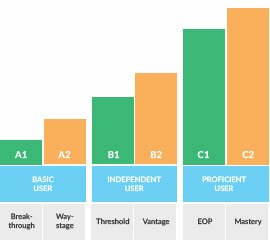 Slightly higher than A1, where a student starts feeling slightly comfortable to open up and speak at a basic level. B1 Intermediate Completing most of the remaining tenses, such as future, expressing regrets and wishes, hypothesis and dreams. This level marks the advent of approaching fluency. One can start to participate in debates and express their opinions at least at a basic level. Can comprehend radio and TV announcements to a certain extent. B2 Upper Intermediate Complex level indicating mastery of expressions and handling work life related situations, presentations, and meetings. One starts learning the nuances and intricacies of the language in this level as well as sayings and idioms. To a certain extent, there is lesser stress for the opposite party to interact with you, compared to B1. C1 Effective Operational proficiency- EOP High vocabulary and themes such as Law, Economy and Social studies are covered. One needs to respond to newspaper articles, and oration skills have to be exemplary. This is a near native level and is normally required to finish in case the medium of instruction of a study course is in the target language. What do you learn and what will one be able to do in each level? Please click here for the “can-do” levels table.